Un truc à vendre ou a échanger ? Besoin d'un chanteur ou d'un joueur de triangle ? C'est ici que ça se passe. Un sujet par personne SVP. ARMAGEDDON DEATH SQUAD (Fra) Necrosmose CD. Digipack. Death metal, between old school death and old brutal death. GOD DISEASE (Fin) Rebirth of horror MCD. Digipack. Old school death with doom influences. NECROPHILIAC (Spa) Chaopula - Citadel of Mirrors Tape. Old death metal. Rerelease of an album from 1992. BONEYARD (Spa)/ DEAD HAND CARESS (Spa) Split CD. Death metal/ Grindcore influenced by old Carcass. 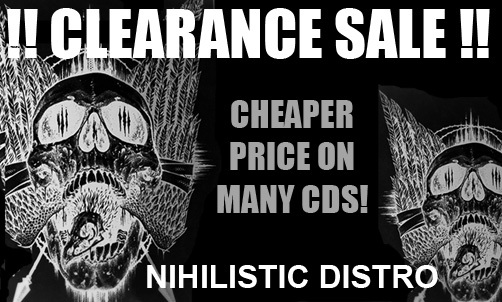 The price of many CDs have been reduced! Help me to make some space before moving to the new webshop! Fanzine: LEGION OF TORTURE (Peru) Issue 4: Infernal execrator, Manzer, Nocturnal Vomit, Black magic mountain goat, corpse grinder, Qasam, Rito profanatorio... Peruvian death metal special... + Reviews. 24 pages. A4. In english. 2019. 2nd hand zine: SENTINELLE (Fra) Issue D: Spear of longinus, Legion of death recs, Invoker, Lion's pride, Nokturnal mortumn, 101 rules of nu metal... + Chroniques, articles... 56 pages. A5. In french. 2006. 2nd hand zine: IN EXTREMIS (Fra) Issue 6: Blacklodge, Skinless, Negate, Exhumed, Misery index, Nightfall, Supuration, Prostiture disfigurement, Bloodshed, Nydvind, The arrival of satan, Your shapeless beauty, Mnemic, Elysium, Gorerotted, Dew scented,.. + chroniques... 56 pages. A5. In french. 2003.